All eyeglasses look great on display in an optical shop and even better on the commercial campaigns of the brands as seen online, in the airports or along the streets… Not to mention the celebs and how they look in their eyeglasses (remember they are followed by a team of experts in style). 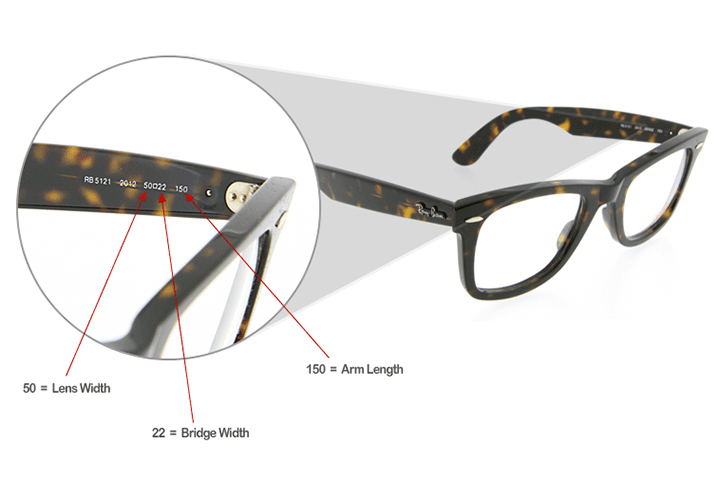 But this doesn't mean any frame will fit well, feel comfortable and look great on you. Glasses usually come in one standard size but for the optical collections that the lenses are clear and more realistic, sizing is important. 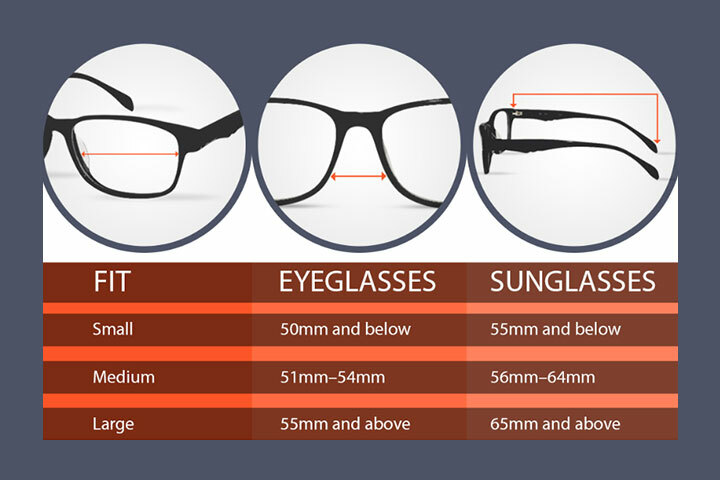 Most people are not actually aware that each frame of eyeglasses may come in two, three or even four different sizes. 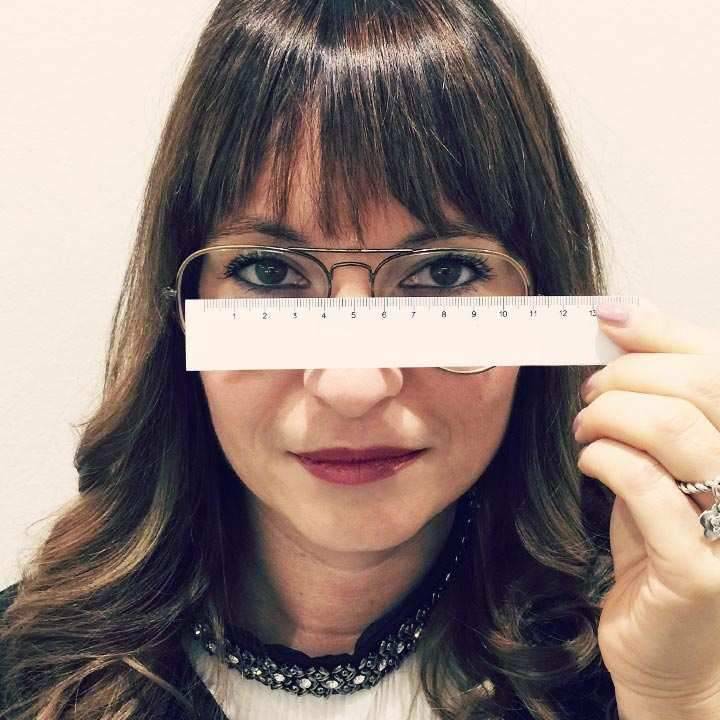 For sunglasses, sizing is more of an aesthetic issue, for eyeglasses sizing is the same as fitting and it is important to know one’s personal measures, just like your size in clothing and shoes. No panic… We want to make it easy for you with our simple guide. If you already own a pair of glasses and you are not yet aware of this, keep in mind that the size is always engraved on the inner temple of your frame. You will actually read the code of the model, followed by the code of the colour and then next to that tiny square , first the width of the lens followed by the length of the bridge and last the length of the temple. Sizes are always calculated in millimeters. Lens-width measures the lens horizontally, at its widest point. It can range from 40mm to 60mm. If you already own a pair you can vary a ±3 mm from your old pair. Bridge is the part that goes across the upper part of your nose and keeps the two lenses attached. It can go from 14mm to 26mm. You can vary a ±2 mm from the length of your previous bridge. Temple length is the length of each arm from one end to the other, including the bent. It usually ranges from 120mm to 150mm and you may choose one that is ±5 mm longer or shorter than your previous pair. Height stands for the highest vertical point of the lens. This measure is not always supplied but some brands do nowadays so if you desire to know it please contact our customer service here. 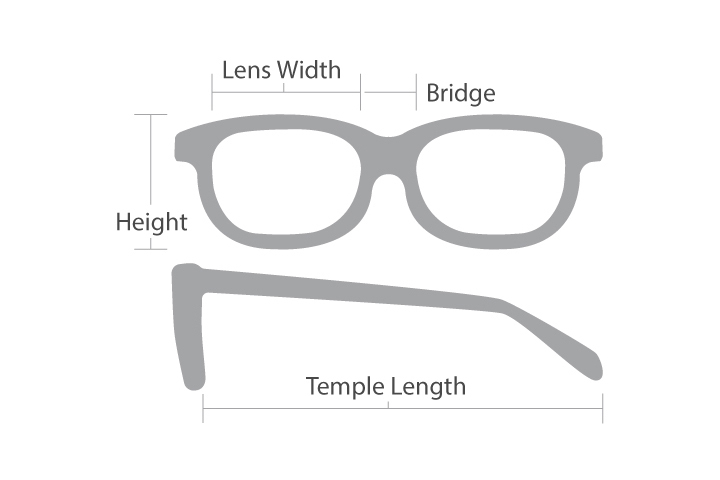 Of course the entire width of the front is the sum of the width of the two lenses plus the length of the bridge. If the numbers aren’t printed or not visible any more, it’s not the end of the world. 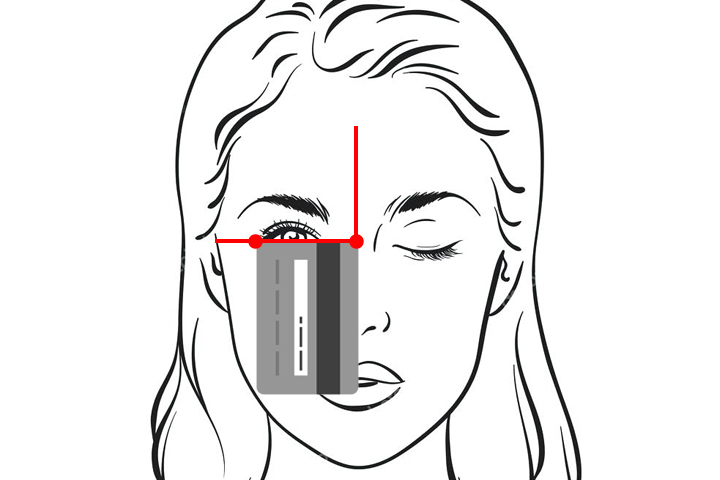 Use a millimeter ruler, stand in front of a mirror holding it below your eyes and measure your face’s width from one temple area to the other. This will give you the maximum width you should go for (including the two lenses and the bridge). The measure that is taken into consideration as most important is the lens-width. Here is a very simple way to decide if you are “Small”, “Medium” or “Large”. Use a credit card (yes, all credit cards in the world are the same size and most importantly, their height corresponds to the width of a medium lens) and place it vertically at the centre of your nose, at the height of the bridge. 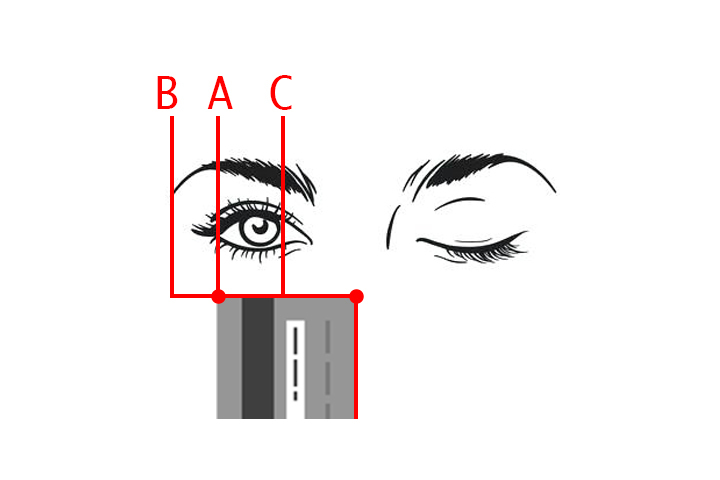 A: If the corner of the card reaches the outer angle of your eye then you are a Medium fit. For medium faces the range you should consider is among 51mm and 55mm in eyeglasses and 56mm to 64mm in sunglasses. B: If the corner of the card goes further than the edge of your eye then you are a Small fit. Your ideal lenses should reach a maximum 50mm of width. Sunglasses-wise go for maximum 55mm. C: If the corner of the card ends before the outer edge of your eye then you are a Large fit and need eyeglasses with size from 55 and above while your sunglasses should be above 65mm. It is easier than what it seems but if you are still unsure about the fit of your frames, feel free to pop into any of our channels and we will be happy to solve any of your doubts!